Legend has it that the Georgia-bound Mayflower only stopped at Plymouth Rock because its passengers ran out of beer. By that logic, if it weren't for beer, we wouldn't even be celebrating Thanksgiving. As much as I wish this story were historically accurate, it's most likely not. While the Pilgrims did drink beer on their transatlantic voyage, as beer in the 17th century was safer than water due to the antimicrobial properties of hops, they probably landed because they were running out of provisions in general. Some accounts say that the Pilgrims set up a brewhouse soon upon landing, but given the hazardous conditions the Pilgrims faced in their first year (47% died in the first winter) it is doubtful they would have made brewing a priority. 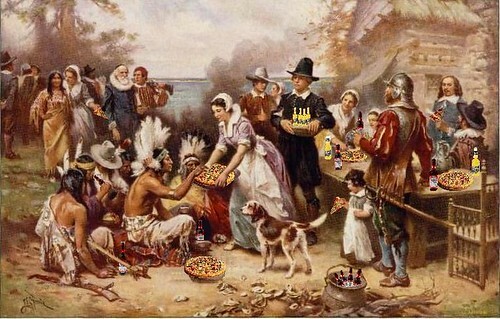 So, odds are slim that the Pilgrims and Wampanoag raised glasses of ale at the first Thanksgiving. But let's face it: most of the dishes that will be on the table come next Thursday would not have been present in 1621 either: mashed potatoes, yams, stuffing, pumpkin pie. Still, that's not going to stop me from enjoying any of these on Turkey day, beer in particular. Here are a few recommendations on what to drink. Before. Before the big meal is prime football viewing time. The day is young: you want to pace yourself with something lower in alcohol. Beer Advocate recommends drinking Pilsener or other light lager so as "not to kill palates too early in the day." This doesn't mean you need to reach for a Bud. I recommend Oskar Blue's Mama's Little Yella Pils: it's on the lighter side yet incredibly flavorful. Plus, it comes in a can, so you still feel like an American while drinking it. During. Pale Ales, Märzens, Ambers and Oatmeal Stouts pair well with turkey and gravy, whereas Belgians and higher ABV beers cut through the rich fats that are in pretty much every Thanksgiving dish. It's really your call. However, you don't want to serve a beer with flavors that will overpower the food, like a well-hopped IPA or a smoked beer. The one time I hosted Thanksgiving I poured Chimay Blue because is packaged in an elegant corked bottle and everyone likes it, and its lightness and high ABV complimented the meal without overpowering it. New Belgium's Fat Tire and Sierra Nevada Pale Ale are safe bets, but I encourage you to try something locally-produced. Dessert. Whether you're a member of the pumpkin pie or the pecan pie camp, both pair well with chocolate, so why not a sweet stout? I'm thinking Pike Entire, a rich, barrel-aged offering from Seattle's Pike Brewing Co. It's not the sweetest offering out there, but an amazing one. Young's Double Chocolate Stout or North Coast Old Rasputin are also good choices. After. Thanksgiving is about indulgence. This is the day to bring out the beers you've been hoarding or whose price point frightens you, the ones you might not buy for everyday drinking. Anything with 'Imperial' or 'barrel-aged' in the name is a good choice. I asked a beer writer associate of mine what he is serving on Thanksgiving; his answer: Autumn Maple from Southern California's up-and-coming The Bruery. At around $14 a bottle, it's not cheap, but is a bargain compared to a bottle of wine of similar quality. This post was mentioned on Twitter by foodista: New blog post: Beer for Thanksgiving http://www.foodista.com/blog/2009/11/19/beer-for-thanksgiving/.. This is great. I'm already checking to see if Mama's Little Yella Pills is anywhere in my area! Great Stuff. The Chimay would also be a great addition to the during Turkey festivs. Thanks again. great post. will save in files for November. thank you.